What will happen to the dog meat market in Busan? The Seongnam City Government’s recent decision to uproot South Korea’s largest dog meat market has shed light on other similar venues in the country. On Feb. 25, animal activists gathered at Gupo Market in Busan -- which is similar to Seoul’s Moran Market in terms of size and product range -- to demanding the closure of dog meat vendors there. The protestors, who called themselves “anti-dogmeat friends,” said the culture of ruthless dog slaughter should be abolished, as it involves a process in which dogs are beaten and electrocuted while being hung midair. In an interview with a local media outlet, Yoon Green, the leader of the group, vowed to carry on with the protest until such businesses within the market are completely abandoned. The Seongnam City Government’s decision to remove the slaughterhouses was revealed last December through an agreement with an association of vendors at Moran Market. The vendors were promised compensation such as financial aid to start new businesses. Gupo Market was established in northern Busan during the Joseon era and grew in proportion after the Korean War. It expanded into one of the largest meat markets in the country in the 1970s and ’80s, with a total of 70 dog slaughterhouses in operation. However, the number of dog meat shops there had dwindled to 22 as of 2017, partly due to the Busan Metropolitan Government’s efforts to attract foreign tourists, who might find such facilities repulsive. In the summer of 2016, the Busan district where Gupo Market is located received almost 250 civil complaints related to illegal dog slaughtering. This included complaints about the stench and noise. Animal activists also frequently voiced their protest. 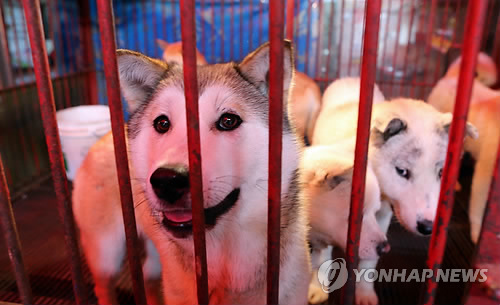 A spokesperson for the Busan Metropolitan Government denied that there is a plan to remove the existing dog meat vendors from the city.